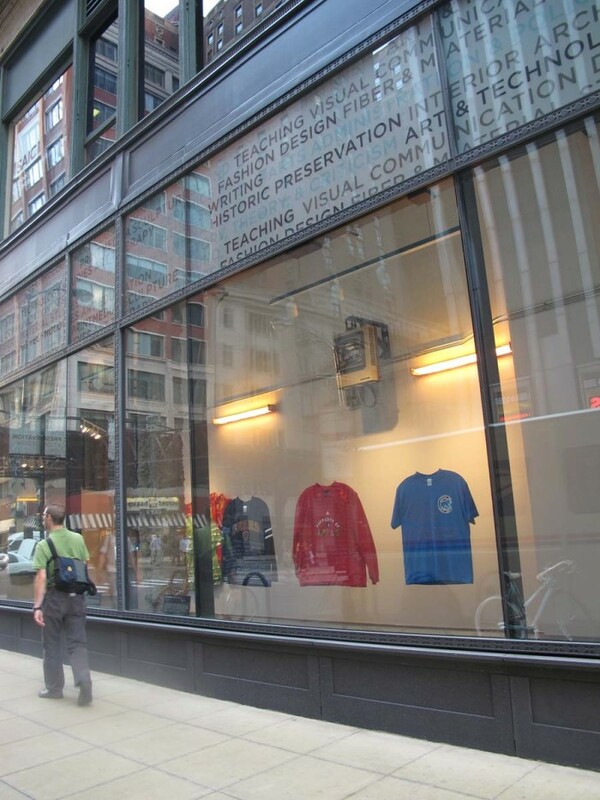 In this project I used Chicago sports teams t-shirts and sweatshirts as a medium to speak of issues of assimilation, passing, and otherness. When people come to the U.S. from other countries they invariably have a moment in which they realize that their appearance is conspicuous, and identifies them as “other”. Many immigrants then decide to modify their wardrobe to “pass”, to attempt becoming more American. I noticed that in Chicago sports team paraphernalia is used by non-natives as a marker of belonging. I decided to use sport shirts to explore the complexities of trying to belong in a foreign place. 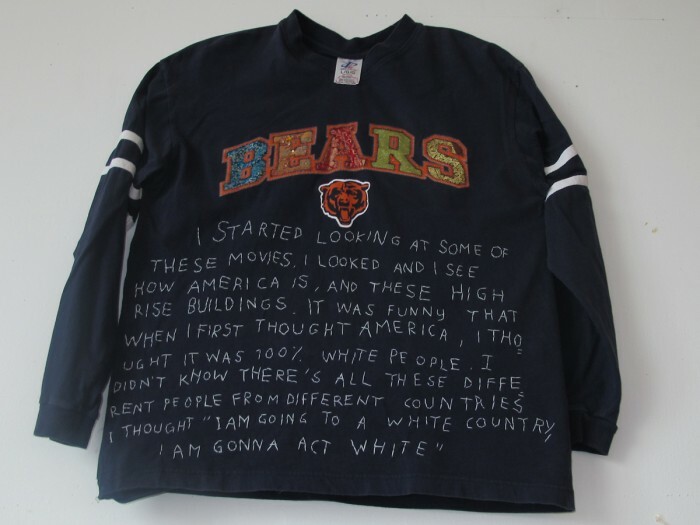 I bought shirts at a local shrift store representing different teams, and I embroidered quotes from recent immigrant to Chicago speaking of trying to fit in and preconceived notions of America. I used fabrics native to the countries where the person quoted is from and superimposed them onto the sport teams logos in order to make the attempted shift between Other and American apparent. I made the shirts’ tags prominent in the piece, as they are made in immigrant countries, such as Honduras, Guatemala and Swaziland. The irony of the shirts being made where immigrants to the U.S. are coming from, and then being used as markers of Americaness speaks of the incredibly shifting and multi-layered quality of contemporary society and the elusiveness of “home”. The pieces are displayed on hangers in the gallery space, where viewers are invited to engage directly with the shirts by touching them, and having a sense of the tactility of the garment. “Money hurts my feelings somehow. Because money in the U.S. is the most important thing. But, what is it? Money is nothing. 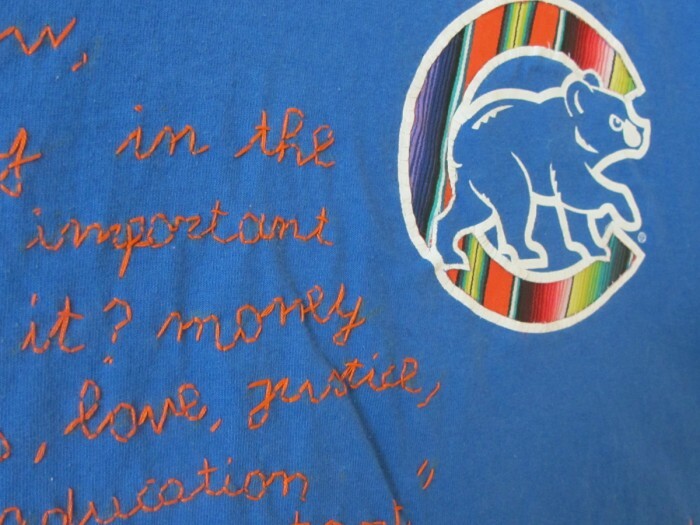 It’s us , love, justice, morals , ethics, education. That’s most important.